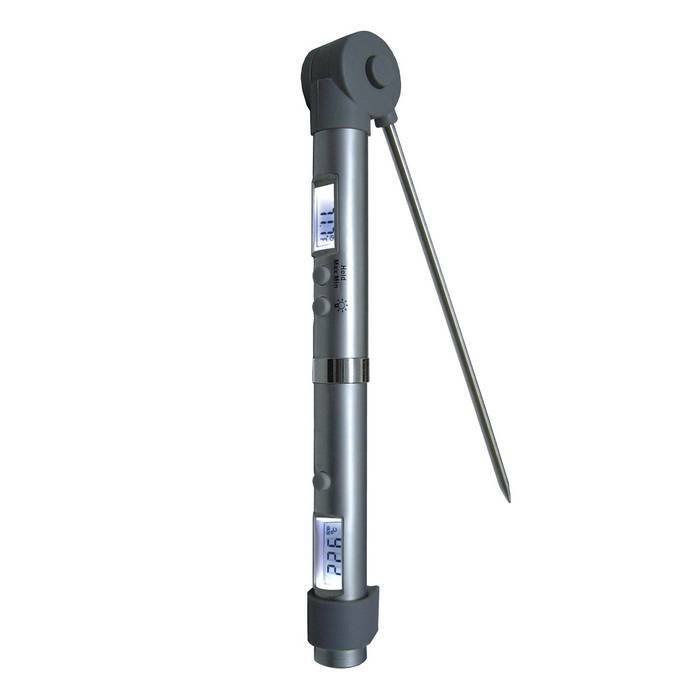 One end of the sturdy metal pen contains a non-contact Infrared thermometer for surface temperature measurements. Press the button to scan temperature and release to hold. IR temperature results are displayed within one second on a backlit LCD. The other end contains a stainless steel probe for penetration measurements and features min-max, and hold functions. The thermistor probe rotates out and locks at 90° and 180°. Two button cell batteries provide 35 hours of continuous IR temperature measurement and two additional button cell batteries power the thermistor thermometer. The displays indicate when batteries need to be changed. Comes in an attractive foam lined metal case with batteries included.